It was actually a series of events that brought me to being diagnosed with post-traumatic stress disorder (PTSD) while living in Korea. At only 19 years old I couldn’t sleep because of night terrors, never wanted to eat, had frequent panic attacks, never wanted to be touched and ultimately wanted to just give up. I fell into a depression like I had never known. While my PTSD limited what I could do, my depression limited what I wanted to do. I had no idea how to communicate with anyone anymore, and basically, quit trying altogether. I ended up going back to the United States — San Diego, to be exact. After about a month of me living there, I found I was not making any improvements, even though I was still going to therapy and taking the medication I was prescribed. This was about the time I saw no hope for my future and began having frequent thoughts of ending my life. My days began and ended with me not wanting to get out of bed, and for the most part, I didn’t. I only ever got up if it was time for work, and by the time I got home I was so exhausted from social interaction and panicking throughout the day that I would just lie in bed and watch TV. I was no longer a person, I thought. I couldn’t be, not living like this. I did nothing to fight away the suicidal thoughts any longer, nor did I want to battle with my anxiety and fear. I just let it happen, and it brought me down to a time in my life I wasn’t sure I was going to make it out of. Then, one day I was on Craigslist looking for a new TV for my room when I came across an ad. It was a picture of a dog. He was black and white, and the fluffiest thing I had ever seen. 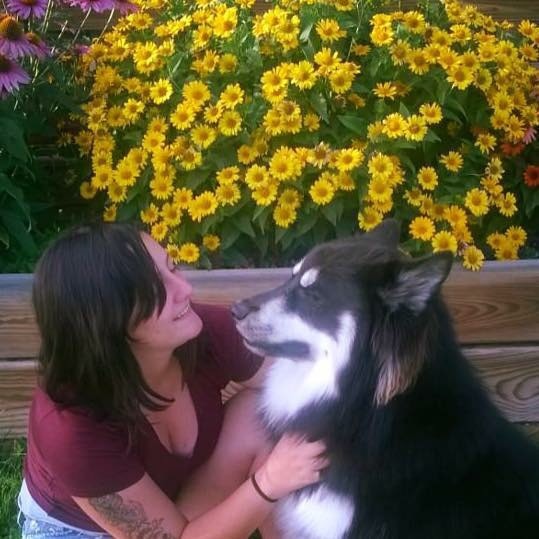 The title read, “One-Year-Old Alaskan Malamute.” Intrigued by his picture, I clicked on the ad. It described this young dog, who was 80 pounds and in need of a new home. I text the number and set up a time to come and meet him that Friday. A friend and I drove the two hours to go and meet this dog. We pulled up, and the woman brought him out. He was large; basically pulling her out of the door to come and meet us. We exchanged the $60 for his adoption, and she sadly said her goodbye to him. When we got back home, my new dog (which I named Ramsey) and I sat in our home. I gave him the toys I bought him, and showed him his bed and let him sniff around the inside of the house and the yard. It was late, and we went to bed. The following morning, I was prepared to do my usual day of just staying in bed and avoiding the world. Ramsey had other plans. He sat by my bed, trying to get my attention. I saw him, got up, and checked to make sure he had his breakfast and plenty of water. After I was up, I looked at him and thought, “I really should take you for a walk, buddy.” So, for the first time in months, I put my tennis shoes on and went for a walk. The next day, again I woke up and he trotted over to me, ready for his breakfast. I fed him and pet him while he ate. I decided we would go to the dog park. We went to the park, and I let him play in the off-leash, fenced in area. A group of owners sat around the table there and chat among themselves casually, but I remained in the corner of the park, too anxious to move until it was time to go. After leaving, I was a bit tense but happy I got to take him out for a while. During the week, after work, I came to make it a habit of taking him to our nearby park. We would go nearly every day. On the weekends, he and I would spend entire days exploring together and just be walking around. I was getting out of my bed every day. I started to feel better. It took about a month and a half before I began talking to anyone at the dog park, and it took a few times attempting to make small talk before I got to courage to sit with them. This was the first time in a very long time I was able to meet anyone new. 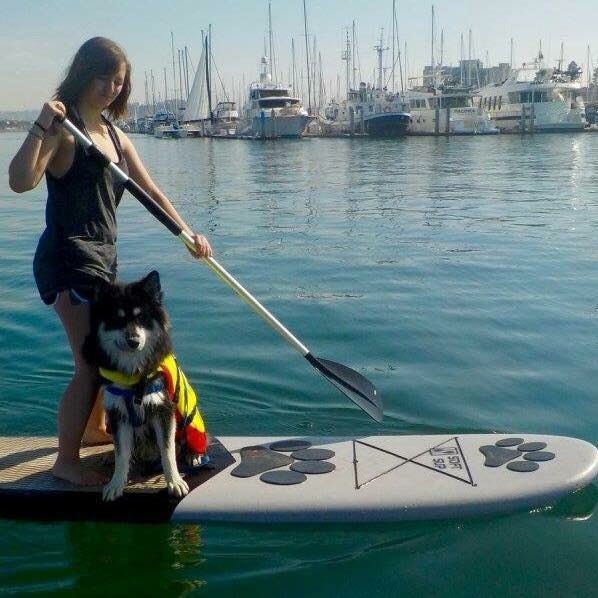 Soon, Ramsey and I were going to the dog beach, paddle boarding, and hiking together almost every weekend. I felt more like a living person, rather than the burden I had convinced myself so many times I was. There were a lot of days that were tough for me still, and I will never forget the first time he saw me have a panic attack. We were in my room, and after it began he jumped on my bed. I was lying on my side, and he put his head on the side of my stomach and began to “talk” — you know, that strange half-howl, half-moan some dogs make. It became a distraction for me, and I ended up calming down and actually laughing pretty hysterically after a bit. We grew a special connection, Ramsey and I. He depended on me, and I on him. Ramsey ended up being trained to help me with my PTSD. He knows when to wake me up before my night terror begins, bring me medication, and when to alert nearby people I am having a panic attack and have stopped breathing. Past his training, he also helped me to see a lot of value in my life and gave me different reasons to start caring for myself as well as for him. Loving myself began again, and has changed my life. I began trying to go out again, and the first time I sat through an entire movie in a dark theater or went to the grocery without panicking were incredible feelings! I am 21 years old now, and I still struggle. I have a hard time with physical contact and crowded public places. I panic, and there are a lot of triggers that can make day-to-day life very difficult, but I want to keep fighting. I have cried, laughed, snuggled and loved him for a while now, and he is my best friend. Ramsey taught me a lot about how to be human again. I got out of bed for him when I wouldn’t get out for myself. He taught me that a little time to just take a walk can ease your mind, that it is OK to need a little help and — most importantly — everyone and everything has a purpose. It was a series of traumatic events that lead me to my mental state; a state that I have finally gotten comfortable enough with to talk about. Hopefully what I have learned can be of use to someone.